From Dubrovnik, we were headed to Bosnia and Herzegovina. 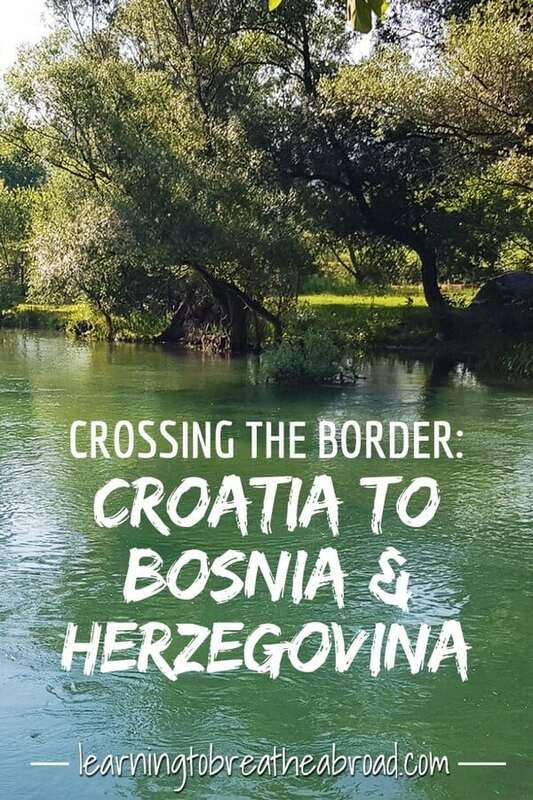 The most popular border crossing from Croatia to Bosnia and Herzegovina is at Neum, but after putting our destination into Google maps it directed us to a border post just 10km South of Dubrovnik at Ivanica. It looked a far quicker route and we were hoping that the wait at the border may be quicker than stories we’d heard about Neum. Within 15 minutes of leaving Dubrovnik we arrived at the border. 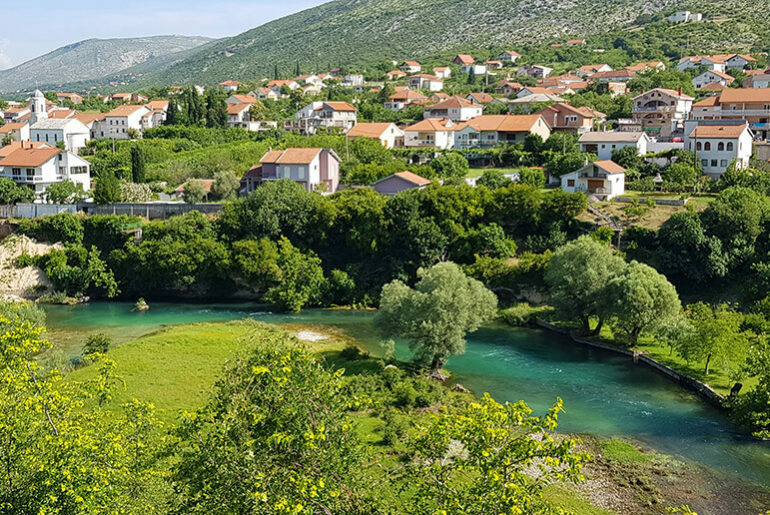 There was a long queue of cars trying to enter Croatia, but as luck would have it there was not a single other car leaving Croatia in the direction of Bosnia and Herzegovina. A quick exit stamp from the Croatian side and then to the Bosnian post. This turned out to be a rather different story. Travelling on a South African passport is not very easy. In order to travel in Europe, I got a Schengen visa. This allowed me 90 days to be in Schengen countries within a 180 day period. ie in a 6 month period, I am only allowed in Schengen countries for a total of 3 months. That would be all well and good but our trip was for 6 months! The Eastern European countries would allow me entry on my Schengen visa, but no matter who I asked, no one could tell me if they would use my Schengen days or not. I needed each and every one of my allocated 90 Schengen days in order to return to the Netherlands via Italy after my time in the Balkans, so I couldn’t afford for Bosnia to use my Schengen days. After an inordinate amount of research I had found out that I could enter the Eastern European countries on a UK visa, hence our first stop being London. This border would be the first time I would need to use my UK visa, so I jumped out the car with a big smile on my face and tried to explain that he must please let me enter on my UK visa. I think I got the only border guard who couldn’t speak English and who, despite my pleading, promptly stamped my Schengen visa. I was on the verge of tears but was told to move on, so climbed into Miles McFlattery, our campervan, and started driving. Five gut-wrenching meters down the road I stopped and did a u-turn, parking on the side of the road. I then walked back to the guards to see if I could do something to change the situation. A kind younger officer tried to assist but the old guard I had dealt with kept saying their computers wouldn’t allow them to enter a UK visa. There was nothing more I could do. Back in Miles, my heart sank. What if this was the case at every border post? What on earth was I going to do? 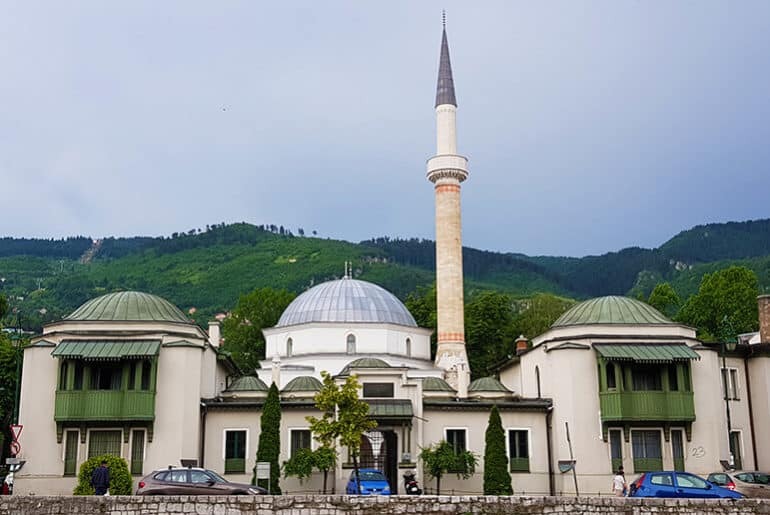 I knew I had about 3 or 4 extra days on my Schengen visa that I had kept for emergencies so I decided to bite the bullet and spend 2 days flying through Bosnia. Decision made, off we set. Destination the town of Blagaj, just South of Mostar. Within minutes of being in Bosnia, Google directed me onto what could only be described as a one-lane gravel track. Surely this couldn’t be correct? Then a car came from the opposite direction – okay so cars are actually driving on this road. With no other option, we bumped along for what turned out to be nearly 20km! We were starting to get low on petrol so the search was on for a station. Not only did we not pass through anything resembling a village, but there was absolutely no sign of a petrol station until we reached the town of Nestro – a whole 80km from the border. Imagine not a single petrol station for the first 80km after entering a country! I had picked out a campsite on our favourite Park4Night App and dropped a pin on my Google map. The road took us through a park with a river running through it, then the road petered out into a narrow dirt track with high bushes on either side. The google pin was on the left, but there were only tall bushes and definitely no road to the left, so we ended up on the main road again. Perhaps we missed the turn? So round we went again, but the same thing, there was definitely no road taking you to the pin. So, we tried a different route along another dirt track. I was just about to give up bumping and grinding down the track, when an elderly man came running into the road and pointed at his campsite and told us to come inside. I was tired and stressed after our visa disappointment, a long drive and now getting lost, but life once again our angels had looked after us and delivered us to an oasis of tranquillity and fabulousness! The campsite was called Auto Camping EKO (43.246576, 17.858727). It was a beautiful location on the Buna River. The elderly owners couldn’t speak any English or German or French, but somehow they managed to communicate with everyone and the best thing ever… they cooked so I didn’t have to! 5 Euro a meal and the portions were huge! 10 Euro per night to camp and 2 Euro for the washing machine. There was a German couple there who had just been to Albania so gave me their book on Albanian Campsites, which is like gold and a lovely French couple arrived during the night. I did have a giggle watching the owners. Every time we heard what sounded like a campervan coming down the track, the wife would shout at the husband, who had to drop everything and run out into the road to stop the campervan and guide them into the camp. The one time he was peacefully sitting at the river’s edge, fishing when the shout was heard. He dropped everything, rod and all and scramble to his feet and dash across the lawns. Poor old chap! 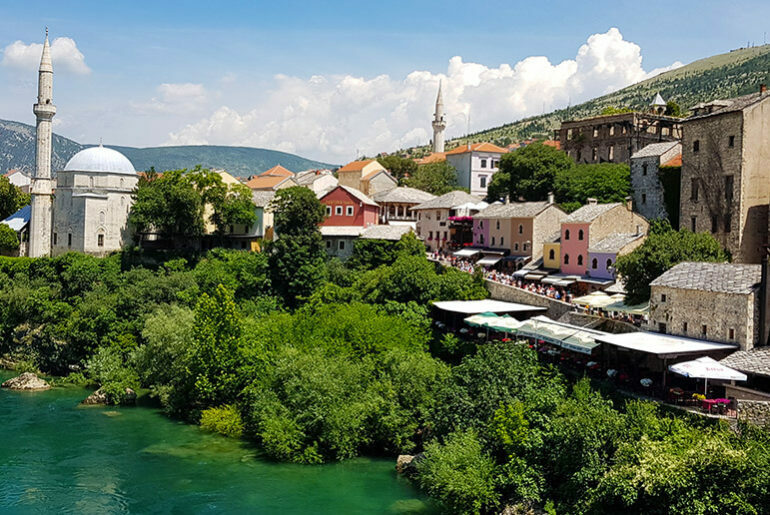 I knew our time was tight and we should be getting out of Bosnia but it was so lovely here and we were surrounded by such wonderful people, so we just stayed and enjoyed the day. We even gave Miles McFlattery a good scrub as he was sprouting algae from his stint during winter in the Netherlands. I even had Tai on the roof with a scrubbing brush! A local family arrived with kids and a puppy and Tai ended up playing Top Trumps card game with them and later in the afternoon a Danish family with their 3 kids arrived. They were also doing a 6-month trip and had just come from Albania, so gave us some great tips. We ended up having a fabulous evening with them recounting travel and homeschooling stories. All in all a fabulous day and I realise how much better these small intimate campsites are, where everyone talks to each other, as opposed to the huge Croatian campsites where you’re surrounded by people but everyone keeps to their assigned sites and only nod in response to your cheery hello!